Polyurethane insulator material marked for removal of the construction site (of a residential building). 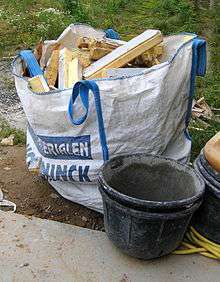 Construction waste consists of unwanted material pronouncing,directly or incidentally by the construction or industries. This includes building materials such as insulation, nails, electrical wiring, shingle, and roofing as well as waste originating from site preparation such as dredging materials, tree stumps, and rubble. Construction waste may contain lead, asbestos, or other hazardous substances. Some certain components of construction waste such as plasterboard are hazardous once landfilled. Plasterboard is broken down in landfill conditions releasing hydrogen sulfide, a toxic gas. In England all personnel performing builders or construction waste clearance are required by law to be working for a CIS registered business. In Kuwait, The Ministry of Finance granted a BOT (Build Operate and Transfer) contract to the Environmental Preservation Industries Company to build the first construction waste recycle plant in the middle east with a daily production of 2,500 tonnes. The government pays tipping fee to the company for waste removal as an incentive to relieve the stress on the environment. The construction waste is recycled to several sizes of gravels that can be reused in construction beside the screened sand can be used in ancillary construction uses.